Aroview: A detailed insiders' account of President Barack Obama's foreign policy team throughout 2016, their last year in office. 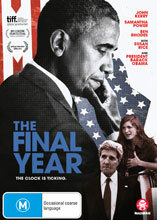 Director Greg Barker has been given unprecedented access to the White House and State Department, and the result is an illuminating survey of the diplomatic efforts of Secretary of State John Kerry, UN Ambassador Samantha Power, Deputy National Security Advisor and presidential confidant Ben Rhodes, National Security Advisor Susan Rice and President Obama himself. Issues that the team attempt to address include the Syrian crisis (and Russia's role), the resurgence of nationalism, climate change and more, all as the clock ticks towards the next presidency that will undo much of their work.